Grand Steel isn’t your traditional steel company, we’re a full line steel service center with over 150 years of combined experience. Driven to continually improve our products, services, and lead times, we are always looking for ways to create a better customer experience. Whether we’re adding a new delivery truck to our fleet, seeking out cutting-edge equipment, or educating our employees on innovative new techniques, we’ve displayed a firm, unwavering commitment to quality products and quality service. In today’s post, we’re going to look at a few of the ways that we maintain our company’s culture of innovation. We know how important it is to our customers that they receive their products on time. Because of this, we maintain a fleet of delivery trucks that are able to quickly, reliably deliver the products you need, when you need them. We believe that the best equipment creates the best products. With a massive facility and highly trained employees, we aim to provide our customers with access to the industry’s best products at the most cost-efficient prices. Speed and affordability are meaningless if quality suffers. Grand Steel is proud to operate our own in-house steel testing lab, in addition to upholding strict inspection standards. 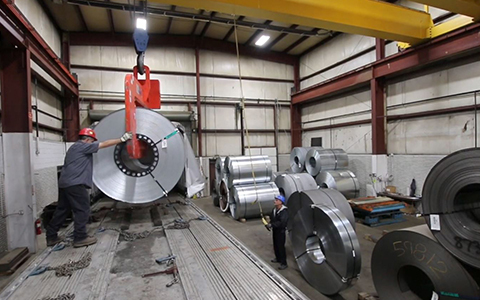 Above all else, want our customers to be confident in the products that they source from our full line steel service center. At Grand Steel, we are constantly looking for ways to better serve our customers. With the industry’s best steel slitting equipment, the most highly trained staff, an in-house steel testing lab, and a fleet of delivery trucks, we are able to deliver better products, more consistently, and with unparalleled lead times. If you’ve been searching for a new source for your operation’s flat, hot, or cold-rolled steel, contact us today to discuss how we can help.